Have a question about Animal Pak? What is it, what does it do, how and when to use or something else? Ask us. The best supplement in the world by 11 or 12 years in a row. ...Ta all said! 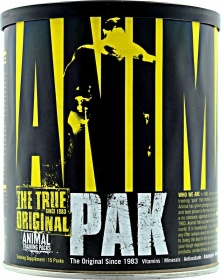 Animal Pak 30 Paks is a discontinued product. Please browse other products you might be interested in..
Take a single pack with breakfast or any other meal, with plenty of water. For competitions and intense training sessions take two packets daily. Take with plenty of water. WARNINGS Animal Pak : Not intended for persons under 18 years of age. This is a potent bodybuilding supplement. Pregnant or lactating women should avoid use of this product. Please consult your physician prior to starting any exercise or nutrition program. These statements have not been evaluated by the Food and Drug Administration. This product is not intended to diagnose, treat, cure, or prevent any disease.